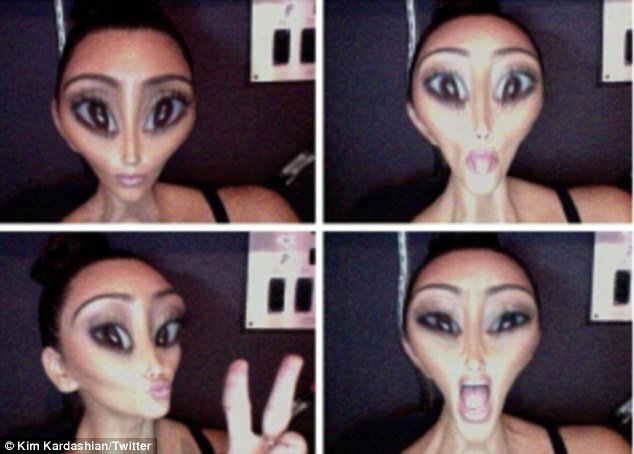 Kim Kardashian has seized the limelight again by posting pictures of what she would look like… as an alien. Kim Kardashian, 31, took some time from her apparently not-so-busy schedule in Hawaii to post the images on her Twitter account today. And she looked more than a little like one of the famous Greys of alien conspiracy folklore. The mysterious creatures were the inspiration for the titular character in last year’s sci-fi comedy hit Paul. In a posting that will be music to the ears of many, Kim Kardashian wrote: “I’m ready for an abduction,” with a series of accompanying shots. She was not the only one receiving the image processing software treatment on her computer, however. Kim Kardashian, who is currently going through a messy divorce with estranged husband Kris Humphries, also took the opportunity to rope in her latest beau Kanye West for a few stills. Whatever she was blabbering about, it certainly gave her fans another insight into how she’s been spending her time in tropical paradise with Kanye West. Kanye West, 35, who has been accompanied by Kim Kardashian as he records new material in Hawaii, earlier this week joined her on three separate trips to a local frozen yoghurt shop.